It’s hard to imagine the early morning drudgery of scraping ice off your windshield right now, when the leaves have barely begun to change colors. Even so, whether you want to believe it or not, it’s coming. At least with this, you can cut the time for the job in half since this tool actually melts the ice as you go. Even so, if it’s as cold as it was last year, you might want to consider heating the car up before scraping. In Sweden, the cars have little heaters in them which work when the motor isn’t running. How cool is that? Very cool. Freezing in fact. 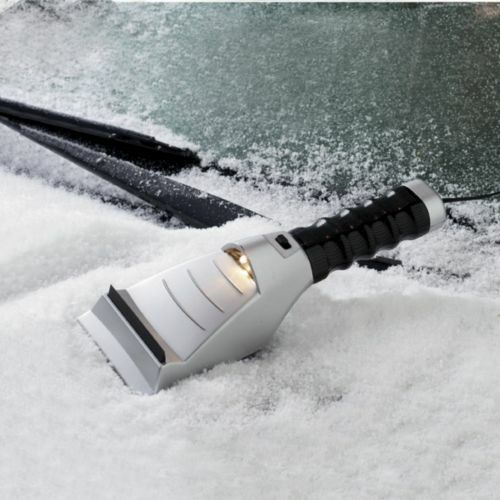 The ice scraper plugs right into your car lighter, which means you don’t have to worry about getting ready to clean your car off, and then realize that the AA batteries are dead. The cord is 15 feet long so it should be able stretch to your windshield unless you’re driving a semi, and it features a built-in flashlight for those dark mornings. Depressed yet? The Swiss Colony Heated Ice Scraper is $19.95.